Having a clear process for communication and decision-making is critical to success in non-monogamy. I've mentioned the importance of healthy check-ins before, but what happens to a lot of great couples is you get stuck in what seems lits an un-ending cycle of checking in. 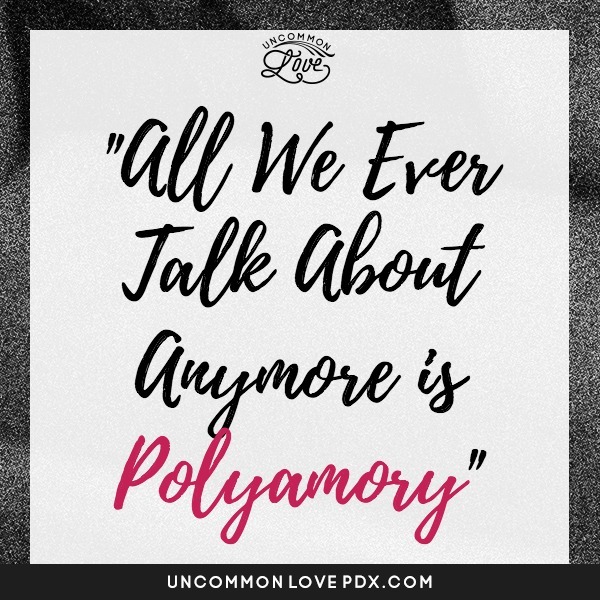 I can't count how many times I've heard folks say "All we talk about anymore is polyamory." Often the anxiety and insecurity that shows up when we start seeing other people leads us to cling to conversations in a misguided attempt to resolve those fears. I've seen some really strong communicators get stuck in conversation loops and lose themselves (and their connected partnerships) to continuous draining late-night talks about agreements and hurt feelings. I'm not saying you shouldn't check in - on the contrary, you need to in order to navigate nonmonogamy successfully. But it can't be the only thing you're talking about and if you're feeling exhausted that's a good sign your conversations are out of balance. Here's a little more in-depth look at a few specifics to help you bring better balance to your conversations when you start opening up. I hope they help you review and renew the boundaries between you as you move forward in polyamory. Knowing where and when you're going to have space to check-in is important, but setting up the best-case scenario for difficult conversations will go much further. Considering basic self-care has reduced conflict in the couples I support by 50%. Am I hungry? Being low blood sugar is only going to make a potentially volatile conversation tenser. Am I focused? Avoid conversations in the car, rushing out the door, or when facing a screen. Am I rested? Conversations at the very end of the day when you're laying down to sleep are likely to be a problem. Am I sober? Clear thinking is critical to clear communication. Setting yourself up for success means considering the time and place to have these conversations. There's no need to rush into one if you're not at your best. It can be challenging to figure out which topics to prioritize first when you're starting out. I've seen clients either choose not to talk about enough (avoiding potential conflict) or try to analyze every detail (leading to unnecessary conflict). Why is this important right now? What is the impact on me? How will sharing this information help my partner and I connect and understand one another? How will this information help me (or help my sweetie)? Lots of folks find themselves engaged in never-ending or daily conversations checking in early on in the process. This is a real issue because it often gets in the way of connecting with each other and can be emotionally exhausting. Be sure you've built in time for breaks to clear your head in this process. Go for a hike, work out, journal, take a bath, or phone a friend. Find ways to stop processing together on a regular basis so you can re-center. Make time for other interests, and set clear boundaries so these conversations don't interrupt your focus at work or when you're focused on self-care. Resist the urge to let relationship maintenance overflow into these other areas in order to maintain your own health and well-being. If you need help managing these difficult conversations I'm happy to help you out. It doesn't have to be such a challenge! GIve me a call for a free consultation.